Mortgage rates have suddenly jumped from near-record lows and are adding thousands of dollars to the cost of buying a home. 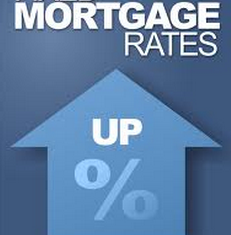 The average rate on the 30-year fixed loan soared this week to 4.46 percent (. from 3.93 percent last week ) This represents the largest weekly increase for the 30-year fixed since the week ended April 17, 1987. The surge in mortgage rates follows the Federal Reserve’s signal that it could slow its bond purchases this year. A pullback by the Fed likely would send long-term interest rates even higher. In the short run, the spike in mortgage rates might be causing more people to consider buying a home soon. Rates are still low by historical standards, and would-be buyers would want to lock them in before they rise further. Mortgage rates are rising because they tend to track the yield on the 10-year Treasury note, a benchmark for most long-term interest rates. The 10-year yield began rising from near-record lows in May after speculation grew that the Fed might be closer to reducing its bond purchases. In early May, the average rate on a 30-year mortgage was 3.35 percent, just above the record low of 3.31 percent. But rates began to surge — and stocks plunged — after Fed Chairman Ben Bernanke made more explicit comments last week about the Fed’s plans. He said the Fed likely would begin to scale back its bond buying this year if the economy continued to strengthen. The effect on buyers’ wallets in just the past two months is striking. A buyer who locked in a 3.35 percent rate in early May on a $300,000 mortgage would pay $1332 a month, according to The same mortgage at a 4.46 percent rate would run $1512 a month. The difference: $180 more a month, or $64,800 over the life of the loan. Those figures do not include taxes, insurance or initial down payments.